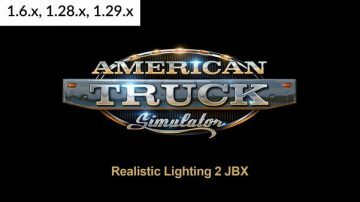 Description: This modification improves lighting, color, automatic exposure, road textures, sidewalk, terrains and other additional improvements. Use my JBX Preset 1.9.7 from Reshade & SweetFX for Best visual of the game environment. v1.2: Adjustments and Improvements in lighting profiles and textures of the environment. The add-on (No bloom) is not necessary for version 1.2. The package includes the preset v1.9.7 of Reshade & SweetFX. Important: Do not use my Mod JBX 2 (SCS) with custom maps not supported.